To offer a quality education in Computer Science and Engineering, encourage life-long learning and make graduates responsible for society by upholding social values in the field of emerging technology. To produce graduates with sound technical knowledge and good skills that prepare them for a rewarding career in prominent industries. To promote collaborative learning and research with Industry, Government and International organizations for continuous knowledge transfer and enhancement. To promote entrepreneurship and mould the graduates to be leaders by cultivating the spirit of social and ethical values. PEO 1:Computer Science Graduates will have successful careers with high level of technical competency and problem solving skills to produce innovative solutions for industrial needs. PEO 2: Graduates will have good professionalism, team work, effective communication, leadership qualities and life-long learning for the welfare of mankind. PEO 3:Graduates will be familiar with recent trends in industry for delivering and implementing innovative system in collaboration. PO1: Engineering knowledge:Apply the knowledge of mathematics, science, and basic engineering fundamentals to the solution of complex engineering problems in the major areas of Mechanical engineering. PO2: Problem analysis:Identify, formulate, review research literature and analyze complex Mechanical engineering problems reaching substantiated conclusions using principles of mathematics, natural sciences and engineering sciences. PO3: Design/Development of solutions:Design solutions for the complex Mechanical Engineering problems and design system components or processes that meet the specified needs with appropriate consideration for public health and safety, and the cultural, societal and environmental considerations. PO4: Conduct investigations of complex problems:Use research-based knowledge and research methods including design of experiments, analysis and interpretation of data, and synthesis of the information to provide valid conclusions. PO5: Modern tool usage:Create, select and apply appropriate techniques, resources and modern engineering and IT tools including prediction and modelling to complex engineering activities with an understanding of the limitations. PO6: The Engineer and society:Apply reasoning informed by the contextual knowledge to assess societal, health, safety, legal and cultural issues and the consequent responsibilities relevant to the professional Mechanical engineering practices. PO7: Environment and sustainability:Understand the impact of the professional engineering solutions in societal and environmental contexts and demonstrate the knowledge for sustainable development. PO8: Ethics:Apply ethical principles and commit to professional ethics and responsibilities and norms of the professional Mechanical engineering practices. PO9: Individual and team work:Function effectively as an individual and as a member or leader in diverse teams and in multidisciplinary settings. PO10: Communication:Communicate effectively on complex engineering activities with the engineering community and with society at large, and are able to comprehend and write effective reports and design documentation, make effective presentations and give and receive clear instructions. PO11: Project management and finance:Demonstrate knowledge and understanding of the engineering and management principles and apply these to one’s own work, as a member and leader in a team, to manage projects in multidisciplinary environment. PO12: Life-long learning:Recognize the need for and, have the preparation and ability to engage in independent and life-long learning in the broadest context of technological changes. PSO1: Apply programming skills to develop new software with assured quality. PSO2: Ability to demonstrate specific coding skills to improve employability. The faculty of Computer Science & Engineering is the soul of many engineering branches. This field is instrumental in bringing the world to where it is today. 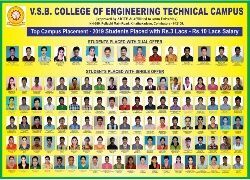 Computer Science & Engineering (CSE) course was started in our institution in the year 2012. Our department has 25 dedicated, well-qualified and experienced faculty members who are specialists in the areas of Database, Data Mining, Computer Architecture, Operating Systems, Image Processing, Wireless Network, Artificial Neural Networks’, Information Security and Programming Languages. They actively involve themselves in research activities in the field of their specialization. They have published a number of papers in Journals and Conferences of National and International repute. The department attributes its success to the creative and innovative outlook of its students also. It encourages students to participate in numerous symposiums and to present papers in them. Students are also made to undergo in-plant training programs, where they hone their technical skill in the realm of computers. etc. Computer Engineers build the world’s infrastructure. In doing so, they quietly shape the history of nations around the world. Only by exploring Computer engineering’s influence in shaping the world we know today, we can creatively envision the progress of our tomorrows. Students and faculty gain knowledge and experience relevant for their further successful career growth in sphere of Computer engineering. Our institute pioneers towards making every individual as an effective Computer Engineer who serves the nation through the knowledge gained.